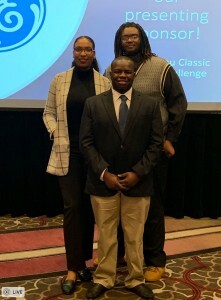 GRAMBLING, LA – November 23, 2018 – Two of the three Grambling State University student teams took home more than $10,000 in cash prizes at the 2018 Bayou Classic BizTech Challenge; a competition challenging students to develop a technology-based business plan. GSU participated as one of 17 colleges and universities from Louisiana and surrounding states who were invited to participate in the cha llenge, sponsored by NexusLA and GE with additional support from Exxon. Grambling State’s winning ideas for a new college application mobile app and a health technology solution won third- and first place in the overall category. In addition, Grambling State student teams took home second and third place honors for the “Digital and Media Technologies” category. The top teams in the categories of engineering and robotics; energy, environmental and agricultural technologies, and digital technologies and software were invited to pitch their business and technology solutions live before a panel of judges at 1 p.m. on Friday, Nov. 23, at the Hyatt Regency Hotel in New Orleans. For interviews and more information about the Bayou Classic BizTech Challenge, please contact mediarelations@gram.edu or call 318-243-5012. This entry was posted in academics, awards, gramstory, studentlife on November 24, 2018 by Jovan Hackley.